Last year was the first time that I planted Brandywine tomatoes and wanted to let you know how successful it was. I soaked the plants in a liquid seaweed solution before planting and put a handful of lava sand and sul-po-mag in each hole. The two plants yielded approximately 34 lbs of tomatoes. I have never seen tomatoes so big grown in Texas!! 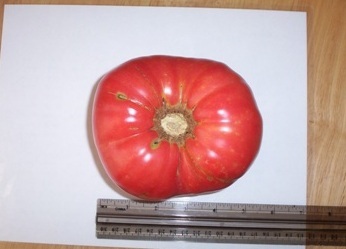 The largest tomato was 1 lb. 10 oz.and not one of the Brandywines cracked. 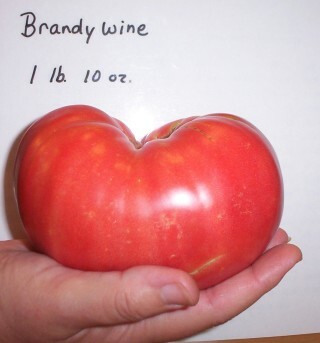 I'm sure all the rain we got last year helped with the production, but all the other tomatoes I planted did not produce as well as the Brandywines. In the attached pictures, the sliced tomato yielded a platter full of "hamburger sized" slices that had a wonderful flavor. 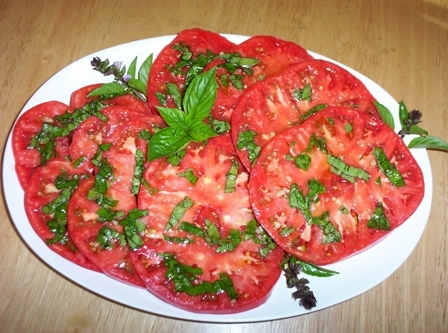 I served it with a homemade dressing of olive oil, basil flavored vinegar, fresh basil and garlic. What a wonderful combination of flavors! Showing off my tomatoes last year to all my friends and neighbors was the best advertisement for organic gardening.